[ARCHIVED THREAD] - Hey Jeep29! how about posting that picture you showed me. I think others here would like to see it and hear about what you did. Maybe it will inspire others to do the same in their areas. Anyway, I came here looking to see if you had posted so I could show a co-worker, but didn't find it. Please post it, or if you don't want to, please IM it to me. Thanks. Here it is. Brief back story: The city of Oak Grove was rumored to be thinking about enacting some gun ordinances. I found out about it on Friday afternoon and left work early to take action. After printing a copy of the law, writing a brief letter explaining the facts and visiting city hall twice all of the offending verbal was removed from all city property. It was all gone by Tuesday afternoon. Once folks realize that the person responsible is subject to legal action and will be responsible for all incurred expenses they become quite cooperative. Remember this sh*t on Christmas!! It takes 43 muscles to frown, 17 to smile, and 3 for proper trigger squeeze; and I'm lazy. Good for you. Keep them honest. It is amazing that these local officials have no idea of their responsibilities under the law, even though they have full time legal advice. is just happy to be here. "Let your gun therefore be the constant companion of your walks"
The sign looks correct now. You know this makes me wonder if the Hopkinsville greenway gun ban is legal too. Give us some details of what it is and someone here can tell you if it is legal. If it isn't legal, maybe we can get it fixed. This one? 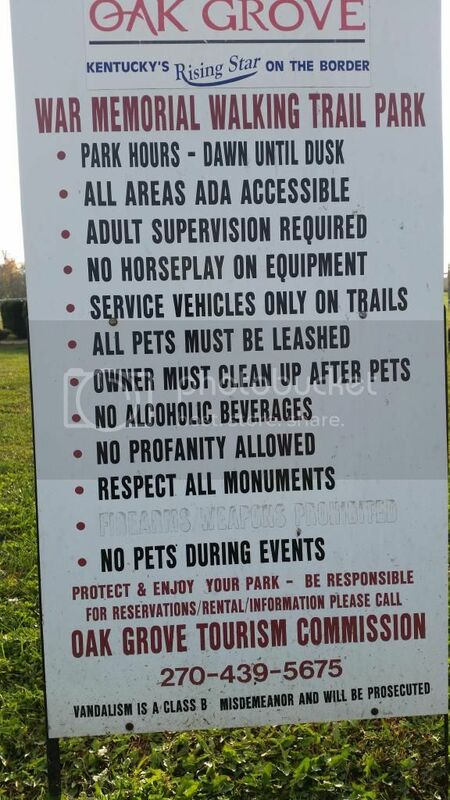 Looks like at the bottom listed under prohibited items. People don't need guns on the trail. It's not like people are getting robbed at gun point on the trail or anything. Oh wait, they are. Just leave your guns in your vehicle in the parking lot when on the trail. Except for the increase in vehicle break-ins at the trail parking lots. Hmmm. I'm also questioning the legality not only because of KY's preemption laws but because the signs are not uniform. The sign at the North Drive entrance for example does NOT ban firearms. Neither does the sign by the library. So if by some chance the signs are legal, if someone parked at the North Drive entrance and carried... by the time they got to the next sign they'd be breaking the law. The one by the public library also does NOT ban firearms - I have a photo of that but didn't think to include the "you are here" portion of the map. I am just a Combat Hot-Air Balloon Pilot.. Our craft is 50X quieter than the B-2 Spirit. The enemy can't hear us until we drop bombs on them..